If you come to our show, you will laugh. If you don't, there's no one who can help you. Improvised music, comedy, scenes, the works. 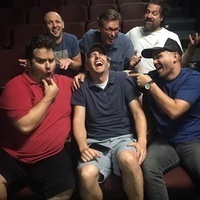 If you've seen "Whose Line is it Anyway" you have an idea of what kind of hilarious, energetic comedy that team improv can be. The Society are 12 time iO West Cage Match Champions! This is a clean show and is appropriate for all ages. Doors open 30 minutes before show time. Seating is on a first-come, first-served basis. Tickets cost $15. Students, use code student for a 20% discount on tickets. Seniors (60+) register using the code senior for a 20% discount.